Image-guided spinal navigation is a computer-based surgical technology that was developed to improve the intraoperative orientation to the unexposed anatomy during complex spinal procedures [1, 2]. It evolved from the principles of stereotaxy, which neurosurgeons have used for several decades to help localize intracranial lesions. Stereotaxy is defined as the localization of a specific point in space using three-dimensional coordinates. The application of stereotaxy to intracranial surgery initially involved the use of an external frame attached to the patient’s head. 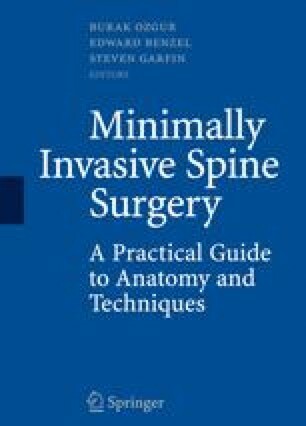 However, the evolution of computer-based technologies has eliminated the need for this frame and has allowed for the expansion of stereotactic technology into other surgical fields, in particular, spinal surgery.